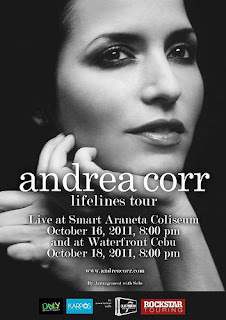 Press Release--Coming from a 4 year hiatus, Andrea Corr of The Corrs is back on stage once again with the same angelic voice and irish accent but a more personal and sensitive take on her music as she includes the Philippines in her world tour to share her new creations from her album Lifelines. Andrea of The Corrs will set foot in the Philippines for a two night concert, first at the Araneta Coliseum on October 16 and at Waterfront Hotel in Cebu on October 18. The concert is produced by Dayly Entertainment (Yellowcard, The Script, All Time Low and Westlife) and new concert producer Karpos Multimedia by arrangement with foreign companies Rockstar Touring, LAMC Productions and Solo. Andrea is the lead vocals and tin whistler of The Corrs who previously consisted of a quartet of siblings Sharon (violin, vocals); Caroline (drums, piano, bodhrán, vocals); and Jim (guitar,piano, vocals).The group came to international fame with their performance at the 1996 Summer Olympics in Atlanta, Georgia, and their support of Celine Dion on her 1996 Falling into You Tour. With a line of the greatest and most memorable hits, “What Can I Do”, “Runaway”, “Breathless”, "All the Love in the World", “So Young”, “Radio”, “Forgiven Not Forgotten” and many more, the group have released fivestudio albums, live DVD’s and numerous singles, which have reached platinum status in many countries and ended up as anthems for everyday occasions such as weddings and the likes. While her siblings concentrated more on family building than hit making, Andrea pursued a solo career in music. It was in 2007's debut Ten Feet High that provided Andrea with her first venture into solo stardom and a project away from a band that she had been emerged so deeply within for over ten years. Andrea was given the platform and the chance to do things on her own. This year, May 2011, Andrea Corr released her second studio album Lifelines with the lead single “Tinsletown in the Rain”. The album also consists of song covers from the artists The Velvet Underground, Kirsty MacColl, Harry Nilsson to Ron Sexsmith, Nick Drake and The Blue Nile. The Lifelines album is locally distributed in the Philippines by Polyeast Records while The Corrs’ previous albums are distributed by Warner Music. Let us revive The Corrs’ spirit with Andrea as she leaves you Breathless once again with her family’s classics and her new take on music! Catch Andrea of The Corrs LIVE at the Smart-Araneta Coliseum on October 16 and October 18 at Cebu Waterfront! For Ticket Inquiries, call Ticketnet 9115555.